Bhattacharyya S1, Wilson R1, Appiah-Kusi E1, O’Neill A1, Brammer M2, Perez J3, Murray R1, Allen P1,4, Bossong MG1,5, McGuire P1. Cannabidiol (CBD) has antipsychotic effects in humans, but how these are mediated in the brain remains unclear. In this parallel-group, double-blind, placebo-controlled randomized clinical trial conducted at the South London and Maudsley NHS Foundation Trust in London, United Kingdom, 33 antipsychotic medication-naive participants at clinical high risk (CHR) of psychosis and 19 healthy control participants were studied. Data were collected from July 2013 to October 2016 and analyzed from November 2016 to October 2017. A total of 16 participants at CHR of psychosis received a single oral dose of 600 mg of CBD, and 17 participants at CHR received a placebo. Control participants were not given any drug. All participants were then studied using functional magnetic resonance imaging (fMRI) while performing a verbal learning task. Brain activation during verbal encoding and recall, indexed using the blood oxygen level-dependent hemodynamic response fMRI signal. Of the 16 participants in the CBD group, 6 (38%) were female, and the mean (SD) age was 22.43 (4.95) years; of 17 in the placebo group, 10 (59%) were female, and the mean (SD) age was 25.35 (5.24) years; and of 19 in the control group, 8 (42%) were female, and the mean (SD) age was 23.89 (4.14) years. Brain activation (indexed using the median sum of squares ratio of the blood oxygen level-dependent hemodynamic response effects model component to the residual sum of squares) was analyzed in 15 participants in the CBD group, 16 in the placebo group, and 19 in the control group. Participants receiving placebo had reduced activation relative to controls in the right caudate during encoding (placebo: median, -0.027; interquartile range [IQR], -0.041 to -0.016; control: median, 0.020; IQR, -0.022 to 0.056; P < .001) and in the parahippocampal gyrus and midbrain during recall (placebo: median, 0.002; IQR, -0.016 to 0.010; control: median, 0.035; IQR, 0.015 to 0.039; P < .001). Within these 3 regions, activation in the CBD group was greater than in the placebo group but lower than in the control group (parahippocampal gyrus/midbrain: CBD: median, -0.013; IQR, -0.027 to 0.002; placebo: median, -0.007; IQR, -0.019 to 0.008; control: median, 0.034; IQR, 0.005 to 0.059); the level of activation in the CBD group was thus intermediate to that in the other 2 groups. There were no significant group differences in task performance. Research from King’s College London has found that a single dose of the cannabis extract cannabidiol can help reduce brain function abnormalities seen in people with psychosis. Results from a new MRC-funded trial, published in JAMA Psychiatry, provide the first evidence of how cannabidiol acts in the brain to reduce psychotic symptoms. Cannabidiol, also referred to as CBD, is a non-intoxicating compound found in cannabis. A purified form of cannabidiol has recently been licensed in the USA as a treatment for rare childhood epilepsies, and a 2017 King’s College London trial has demonstrated cannabidiol has anti-psychotic properties. However, exactly how cannabidiol may work in the brain to alleviate psychosis has remained a mystery. The researchers studied a group of 33 young people who had not yet been diagnosed with psychosis but who were experiencing distressing psychotic symptoms, along with 19 healthy controls. A single dose of cannabidiol was given to 16 participants while the other 17 received a placebo. 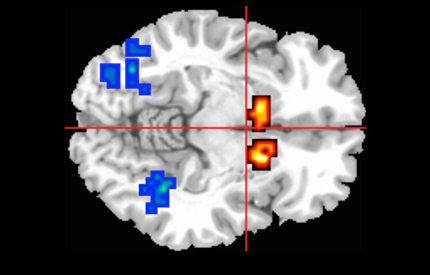 All participants were studied in an MRI scanner while performing a memory task which engages three regions of the brain known to be involved in psychosis. As expected, the brain activity in the participants at risk of psychosis was abnormal compared to the healthy participants. However, among those who had cannabidiol, the abnormal brain activity was less severe than for those who received a placebo, suggesting cannabidiol can help re-adjust brain activity to normal levels. The influence of cannabidiol on these three brain regions could underlie its therapeutic effects on psychotic symptoms. Intriguingly, previous research from King’s College London shows cannabidiol appears to work in opposition to tetrahydrocannabinol (THC); the ingredient in cannabis responsible for getting users high which has been strongly linked to the development of psychosis. THC can be thought of as mimicking some of the effects of psychosis, while cannabidiol has broadly opposite neurological and behavioural effects. Dr Bhattacharyya and colleagues at IoPPN are now launching the first large scale, multi-centre trial to investigate whether cannabidiol can be used to treat young people at high risk of developing psychosis. The trial is supported by a £1.85 million grant from an NIHR and MRC partnership. Some estimates suggest that in England alone, over 15,000 people present with early symptoms of psychosis every year. Despite symptoms that can be extremely severe, there are currently no treatments that can be offered to patients at high risk of psychosis because current anti-psychotic drugs can have serious side-effects.